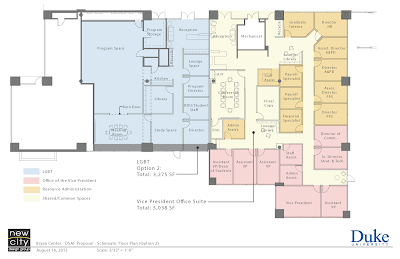 First let us correct an inconsistency: The new plan for the LGBT center does include a programing space that is of similar size to our current space. Yesterday Members of the Blue Devils United executive board made a case to the Senate using the limited information we were able to receive from the administration. A previous design only granted the center half of our current programing space. And while this final design does grant us more programing space than the original, it takes that space from other aspects of the center. We were able to receive a layout including square footage for the previous design, but not square footage for this latest design. Note: the information on the previous design was not received from either the administration of the LGBT center, but forwarded by an outside ally of our cause. This morning we were finally given a complete layout that included square footage. Note: It took two months, pressure from alums, and legislation from the DSG Senate to finally receive the complete information requested months ago. Let us be clear: We will continue our quest for more space and we ask that the administration be straightforward and clear with the facts and information so that we can have an accurate and truthful conversation about the future of our Center. Two weeks ago I received this image, an image of a LGBT Center drawn and set forth without any consultation with its major stakeholders-the undergraduate LGBT community. It should come as no surprise to you that the administration has once again ignored the needs of our community and attempted to silence our concerns. There is clear and painful history of institutionalized homophobia employed by this university that spans decades. From the dechartering of the Gay and Lesbian Alliance in 1983 to the current outright disregard for the LGBT community as the Center relocation process has plainly illustrated. In the spring we were promised a seat at the table to design our own space, and given an assurance that the final plan would only be set fourth after student consultation. But as evidenced by the final design, those promises were not kept. Put simply, we were systematically ignored, and blatantly lied to. Inquest into the process over the summer received responses that at best could be described as evasive. Both Janie and Jess’s office space have been slashed to create the new spaces. 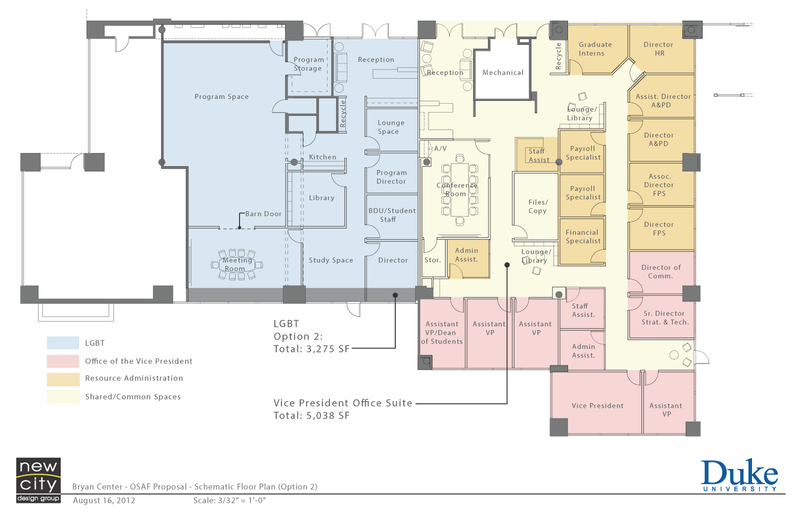 The Administration’s plan grants the LGBT Center less space than what was promised, and our programing space has not been increased. Any of you who have attended a major event (Lav Grad, Orientation Reception, Guest Speaker, etc) in the center know that our current space is already inadequate. The fact that the administration would refuse to increase that space illustrates that either they ignored the information highlighted in our report, or just didn’t read our report at all. It is also worth noting that the administration told us to form a study group so that they could better address the needs of our growing community. After we turned in the results of our research to them, that was the last we ever heard of it. No further contact was made with the students, faculty, and alumni that were part of this study group to discuss the findings of the report. Either way, let us make this statement again- Due to the explosion of programming and rapid growth of our community, we need a programming space that allows for the nurturing and growth of our community. THEREFORE WE DEMAND that the new LGBT Center be increased to at least half the size of UCAE, as was previously promised. We also give thanks to the Duke Student Government for their support in this cause and their resolution. We are not asking for special treatment or requesting unreasonable concessions; we only demand what was promised to us, and what is truly and duly owed to us. So, once again, we assert that our administrators must embrace their responsibility to Duke’s LGBT population and acknowledge our right to speak and be heard. This is disappointing. It makes me think of the past two years when I, as a parent, was approached to give to the Duke Campus Campaign (or whatever the parent fundraiser is named.) I agreed to give the requested amount, and I was asked if I had a preference for how the funds would be used. I stated that I wanted the funds to go to the LGBT center. I was told that this was not possible, so I ended up just donating it to Trinity, my son's college. Sounds like the Center could have used those funds.. Or would it have mattered? Very disappointing! I believe you're referring to the Annual Fund. I wish you could give directly to them, but they only accept donations to facilities that all students can use, which, for some reason does not include the LGBT center, even though the space is accessible to anyone who wants to use it.